Imagine the birth of a figure like the Biblical Messiah in contemporary New York. What would he do? Where would he live and how would the people around him react? What would be his fate? This is the starting point and theme taken by James Frey in his new novel, The Final Testament of the Holy Bible. Of course, since this is Frey writing, the approach taken is provocative. The Last Testament is a book which is likely to stir strong feelings in a significant proportion of readers, and it will probably infuriate as many people as it will amuse. James Frey is probably best known for his autobiography, A Million Broken Pieces, which was released to great acclaim in 2006. The editors of Amazon.com selected it as one of their books of the year. It was an inspirational story of a man who overcame great, almost overwhelming, adversity to make a success of his life, and topped the best sellers list. Oprah Winfrey was particularly taken with the book – Frey was interviewed on her chat show, and she promoted the book strongly. Then it gradually emerged that maybe elements of the book were exaggerated. Frey initially sought to deny this, but eventually confessed. A great scandal ensued – Winfrey condemned Frey, the publisher offered readers their money back (though few took them up on the offer), and Frey became persona non grata. However, there was never much doubt that he is a very talented writer, and he has now turned his attention to another life story altogether. In The Final Testament, Frey’s Messiah figure (Ben Zion) is charismatic, other worldly and identifies strongly with the dispossessed and downtrodden, traits shared with the Biblical Messiah. But he also says that this life is all there is and that God has no interest in us; organised religion (all, but especially Christianity) is a grand fraud deigned to maintain power in the hands of the few. Representatives of organised religion are almost universally presented in a bad light. And the key to happiness is to love others, promiscuously and literally, without concern for gender. Ben Zion proceeds to demonstrate how this can be achieved, which Frey describes in considerable detail, and in doing so transforms the lives of those around him. The book is presented as a serious of chapters told from the perspective of those meeting the Messiah, with titles including Matthew, Mark, Luke, John, Esther, Ruth etc. The layout of the text (left justified) mimics that in many Bibles. Frey stops short of dividing it into verses (although I’m sure he was tempted). No quotation marks are used throughout, which at times makes it difficult to be sure who is speaking. The book follows approximately three years in Ben Zion’s life from the age of 30 until his death/disappearance, which limited information about his early years (sound familiar?). He is a mysterious figure, but reading this book you can understand why he has such a profound impact on those around him. Frey was unable to find a US publisher for his novel, so it is self-published there and available through the Gagosian art gallery. 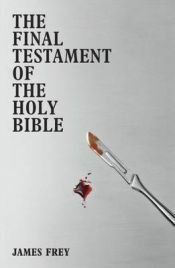 In the UK, The Final Testament has attracted reviews which vary wildly, from five stars to less than zero. It is deliberately provocative, and anyone planning to read it needs to understand this. However, I enjoyed it; Frey makes very good points which some may find uncomfortable, but which deserve to be considered. He is a talented story teller and a very good writer, although not yet a great one. The various voices were too similar (although some swear more than others), but the story never lagged. Some sections were undoubtedly moving, and this is a book that I will remember and recommend (though perhaps not for everyone). No Comments on "The Final Testament of the Holy Bible"